Retired Cowboys great Johnathan Thurston believes Shaun Johnson's potential departure from the Warriors would be a massive blow for the Auckland club. Photo / Photosport. Retired North Queensland great Johnathan Thurston believes million dollar halfback Shaun Johnson could become an NRL premiership winner if he was to leave the Warriors to join a rival club. 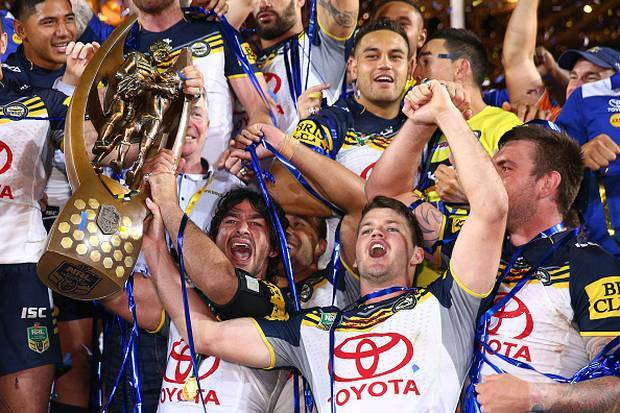 The Cowboys 2015 grand final winning captain's comments come after the Warriors dropped a bombshell last month in announcing Johnson was free to test his value on the open market. The Kiwi test star has a year to run on his current contract but the Warriors are yet to make an offer to re-sign the 162 game veteran beyond next season. Warriors CEO Cameron George previously confirmed the club would look to open talks with Johnson once he returned to New Zealand following the Kiwis recently completed end of year tour of England. It's understood Johnson is currently away on holiday and discussions between both parties are not likely to take place until early in the New Year. Thurston feels Johnson's potential exit from the Warriors would be a huge blow to the Auckland franchise, but says a shock move to another club, such as reigning premiers the Sydney Roosters, could help the mercurial playmaker realise his full potential. "Certainly it would be a massive loss if he does explore his options and goes to another club," he told Radio Sport in a wide-ranging interview promoting the release of his book Johnathan Thurston: The Autobiography. 2015 premiership winner Johnathan Thurston says Shaun Johnson could win a grand final with another club if he did move on from the Warriors. Photo / Getty Images. The Warriors hesitancy in offering Johnson a contract extension comes after he re-signed with the club last year on a two-year deal worth seven figures to become the highest paid player in the club's history. The door is not shut on Johnson remaining at Mt Smart but sources close to the Warriors have revealed they are no longer willing to fork out the sort of cash reserved only for the game's elite players to keep him on their books. The 28-year-old has struggled for consistency since bursting on to the scene in his 2011 rookie season and doubts hang over whether he is capable of helping deliver the club an elusive first premiership title. Thurston is sympathetic to his former New Zealand test rival's predicament, with Johnson having lined-up alongside a rotating cast of halves partners over the last eight seasons. The four-time Dally M medal winner also acknowledged the Warriors No 7 has struggled to develop his organising skills and credits the arrival last season of experienced five-eighth Blake Green for helping to ease the burden on Johnson's shoulders.